Please be informed that, there will be a seminar on 2018 Entrepreneurial Leaders Seminar Series –23th Series on 5 September, 2018 (Wednesday) from 7.30pm. 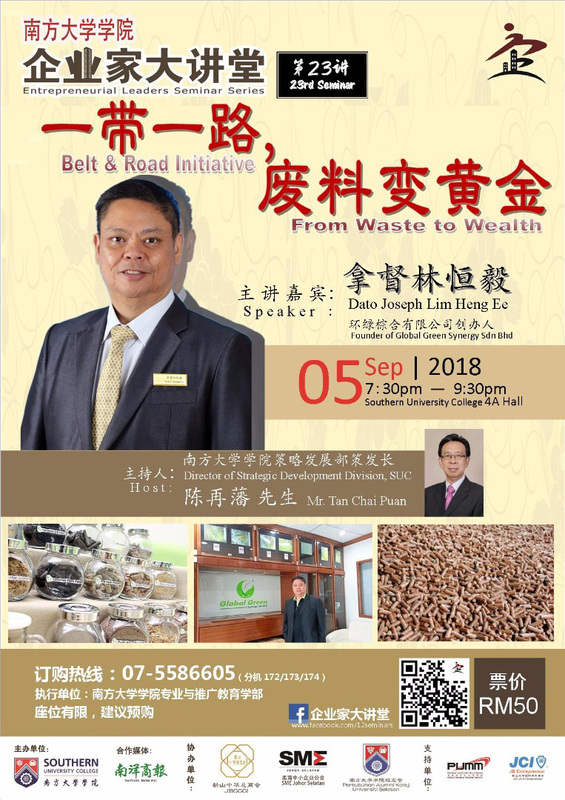 This seminar is organized by Southern University College, co-organized by Johor Bahru Chinese Chamber of Commerce and Industry (JBCCCI), SME Association of South Johor (SMEJS) and Junior Chamber International (JCI) Johor Bahru. 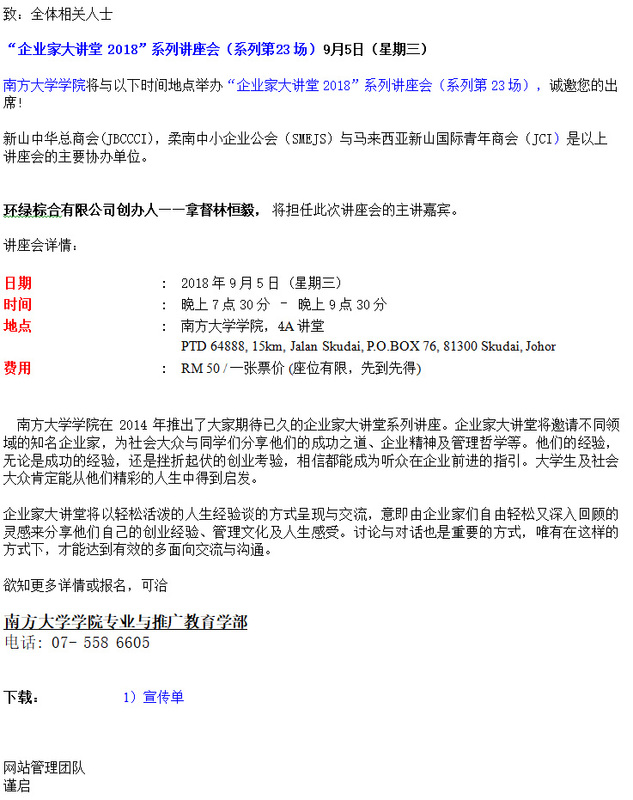 Dato Joseph Lim Heng Ee, Founder of Global Green Synergy Sdn Bhd is invited as the keynote speaker for the event. Southern University College is launching the long-waited Entrepreneurial Leaders Seminar Series in 2014. In the first series, we will invite well-known entrepreneurs to share their success, entrepreneurship and management philosophy for the public community and the students. Entrepreneurs are freely relaxing and in-depth review of inspiration to share their entrepreneurial experience, management culture and life experience. Throughout the discussion and dialogue, it is important to achieve effective multi-faceted exchanges and communication between entrepreneurs and participants. In the long term, it will become an important education component of the Southern University College and development of the whole industry. It is not only allows us to understand the spirit of entrepreneurs’ business practices, while also learning how to influence individuals to participate in society and national enterprise development. For further information or registration, please visit our website: http://jbccci.org.my or contact Southern University College (07- 558 6605).